It goes without saying that the human brain wasn’t designed for trading. When we trade, rational and irrational parts of our brains work simultaneously: we consciously make decisions that we believe to be rational while under the influence of external – and often unrecognised – forces. As such, the result across the retail trading industry is clear: more traders are failing to make a profit across all trading platforms. 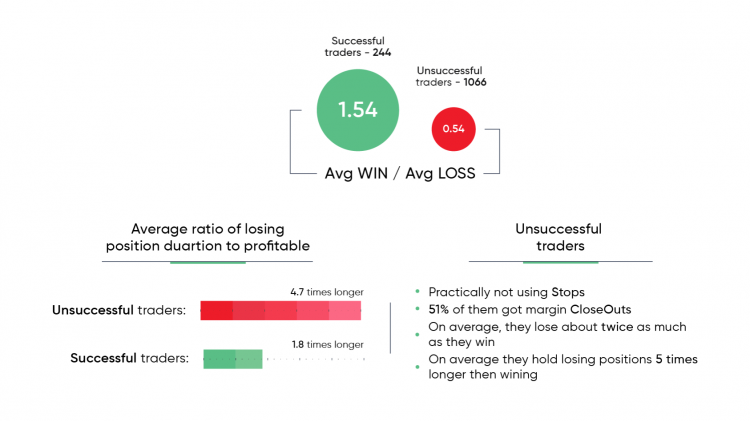 Recent research has shown us that, while the majority of trades prove to be profitable, traders are often losing more money on their losing trades than the total amount they make on their winning positions. For instance, in one case on the EUR/USD market, 61% of trades closed out at a profit with an average of 48 pips, while the average losing trade was worth 83 pips. The value of the loss was, then, far higher than the average gain. At Capital.com, we want to limit the number of our clients who lose money and help them to protect their profits for as long as they can. That’s why we’re the only company across the retail trading industry to invest our time and money into addressing this problem. We’ve taken what science and psychology has taught us to build a highly-specialised, uniquely-designed AI system that analyses your trading behaviour. From analysing the articles you’ve read in our News feed to analysing the trading history of each client, our system detects over 50 biases that commonly – and unknowingly – affect traders and provides you with personalised feedback, tips, and solutions to help you make smarter decisions when placing a trade. And because our AI system is iterative, we are constantly making changes to the system to help it to help you to make better trading decisions. Since introducing our AI system in 2017, the outcome is unmistakable: more of clients are keeping their hard-earned profits than ever before. But advanced learning technology of this kind goes further than merely understanding what news articles you’ve read or the markets in which markets you have expressed an interest. It also looks at the precise metrics associated with a particular trade and the actions you make while a position is open – whether that be the point at which you closed the trade or the point at which a stop-loss order was manually or automatically activated. The AI system also helps us to group users based on their location and the markets they are most interested to enable collaborative filtering, which allows us to offer insights on a cluster of markets that are traded by similar uses in a particular geographical area. Such deep-level personalisation allows us to ensure that we are only ever providing you with information that is important to you. Our commitment to building a deeply personal and intelligent trading platform means that we are able to build a stronger relationship with our clients by understanding their needs and preferences, and in doing so, help them to trade more successfully. For instance, between May and August 2018, we analysed all clients who opened more than 10 trades. We found that, on average, unsuccessful traders held losing positions 4.7 times longer than profitable traders – indicating that the pool of unsuccessful traders had greater exposure to the effects of the disposition bias. In a situation like this, the use of machine learning to suggest relevant educational material and target traders who showed signs of the disposition bias in their trading activity means we are able to help our clients learn from their decisions and improve their entry and exit points in the future. Similarly, in a landscape where only 30% of our clients use stop-loss orders, we tried to predict what the picture might look like if all traders put stops in place. 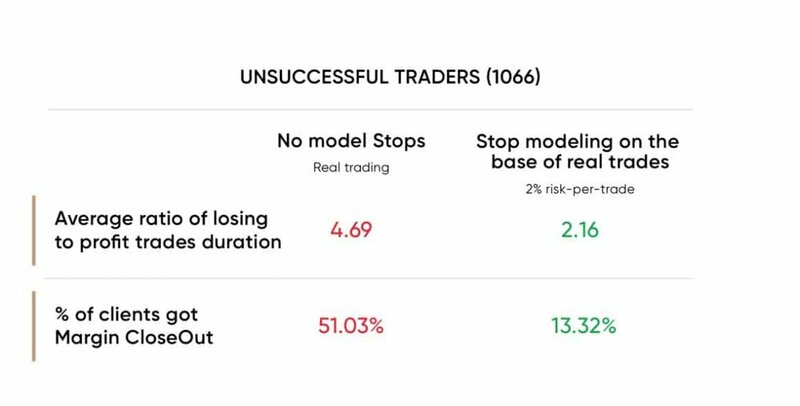 For unsuccessful traders, the modelling of possible results has shown us that, by utilising stop-loss orders on just 2% of their capital, it would lead to a 2.16 times decrease in time spent in losing positions in comparison to winning ones. Additionally, according to the same stop-loss modelling, only 13.3% of clients would experience a margin close-out – compared to the 51% who saw margin close-outs occur in reality. By analysing trading behaviour in this way, we are helping trades in these situations by sending them personalised messages to remind them of the ability to set stops on their trades, helping them to profit. Machine learning is key to help even the most innovative trading providers transition from niche players to mass-market leaders in the fintech space. It provides companies, like ours, with the ability to develop hyper-targeted recommendations and content to clients on an unprecedented data scale. In the past, data analysts might have been able to apply elements of segmentation to their user database and offer those groups different products or services. However, machine learning enables this process to take place at a much more granular level and at a much greater scale – analysing vast quantities of data to provide unique user experiences that are genuinely personalised and targeted towards an individual’s interests and preferences. Capital.com launches in Spain as official sponsor of Valencia C.F.